I am a founding and managing partner at York Rehab. I graduated from the Physiotherapy programme at University of Toronto in 1986 and have focused my studies and practice on orthopaedics since that time. I have taken many post-graduate courses, including treatment of temporo-mandibular joint (TMJ) problems, scoliosis and all the levels of the Lyn Watson approach to care of the shoulder. In addition, I am a certified facial therapist, treating such problems as Bell’s Palsy and acoustic neuromas. I am certified in acupuncture with the Acupuncture Foundation of Canada. Many of my studies have focused on treatment using the McKenzie approach of Mechanical Diagnosis and Therapy, and I became credentialed in this approach in 2001. The McKenzie system is an excellent fit with my values of educating patients and promoting their ability to self-treat and manage their problems. 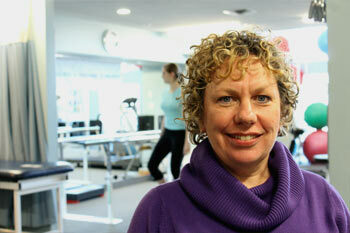 In addition to working at York Rehab, I have been working at Southlake Regional Health Centre for 26 years. This experience has provided valuable learning, especially with the ability to manage post-operative patients. I have a special interest in sign language and have been treating hard of hearing patients at both locations. A perfect day is a summer day spent relaxing on the water!